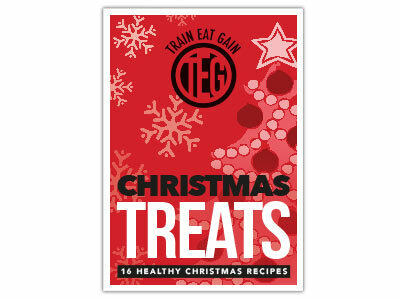 This festive recipe comes from our Christmas Treats Recipe Book which is free to download! Try it out for yourself and tweet us a picture with the hashtag #TEGChristmas. With so much food around at Christmas, I relish the chance to eat a nice, warming, light but filling salad during the festive period. 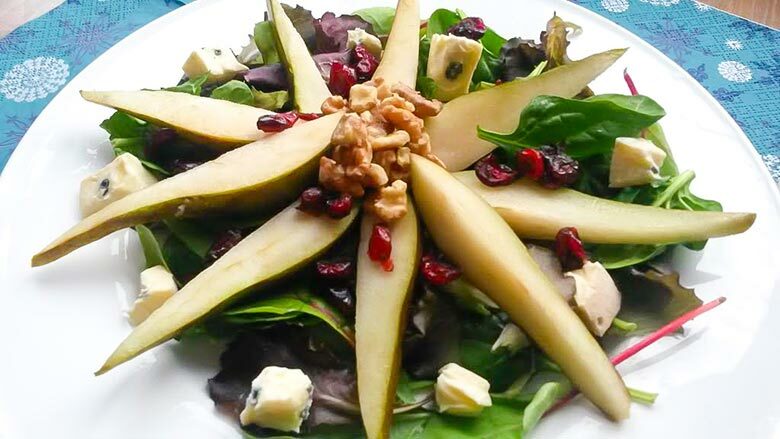 Combining the sweetness of the pear slices and cranberries with crunchy toasted walnuts and chunks of strong blue cheese — this really is a taste sensation yet it’s packed with healthy ingredients. This delicious warm salad is full of good fats and contributes to two of your five-a-day. If you’ve not roasted pear slices before, this will open your eyes to how amazing they taste in a savoury salad! 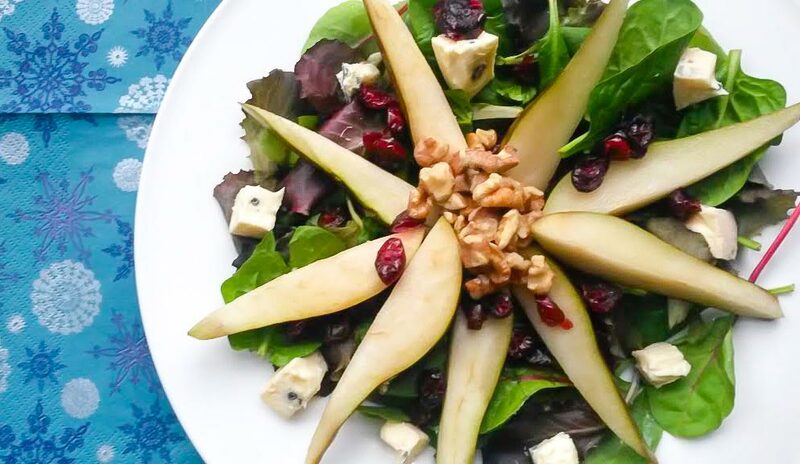 We love to see your versions of our recipes – be sure to share your photos and opinions of this festive salad with us on Twitter (@TrainEatGain). Preheat the oven to 200°C (390F). First, put the pear slices in a bowl along with 1 tsp of walnut oil and make sure all are coated. Tip into a baking tray and roast for about 15-2o minutes until golden and softer (but not mushy!). Remove from oven. While the oven is still on, put the walnuts on a baking tray and bake for a couple of minutes to toast them. Remove from oven. Divide salad leaves between plates. Sprinkle over dried cranberries then place the pear slices on top while still warm. Scatter over the blue cheese chunks then top with the toasted walnut pieces. Whisk together the remaining walnut oil, red wine vinegar and seasoning, then pour over your festive salad – now enjoy! Pamela is a social media geek, music lover, keep fit freak and health food blogger from Manchester. Focuses on gluten-free, high protein recipes made from clean eating ingredients, it's her mission to create healthy AND tasty recipes for all to enjoy. Check out Pamela's blog for more inspiration: www.spamellab.com.